If you work outdoors in all kinds of weather, it is very important that your safety boots are sturdy. They should be intended for rough environments, so a durable leather boot is often preferred. In addition, the sole has to be extremely slip resistant to avoid trips and falls on slippery and uneven surfaces. To decide whether the footwear is suited for your work environment, the sole can be tested in two different categories; oil on steel surfaces (SRB) or soap on a ceramic surface (SRA) on flat ground and on a 7-degree slope. With the soles tested to withstand different challenges, your attention can be on the job at hand, rather than the ground you are walking on. The safety boots in the Mascot Footwear Industry range meet the demands of both SRB and SRA, thereby obtaining an automatic SRC; the best standard for slip resistant soles. In addition, a PU/rubber sole is especially designed for demanding environments and can resist temperatures of up to 300°C contact heat. The multifunctional shank stabilises the middle part of the foot and spreads the kinetic energy across the whole of the foot, thus reducing the stress on the lower leg. The position of the shank (under the heel) ensures that the heel is in constant contact with the cushioning area, which provides a good foothold. This is especially important when walking on uneven surfaces or working on ladders. 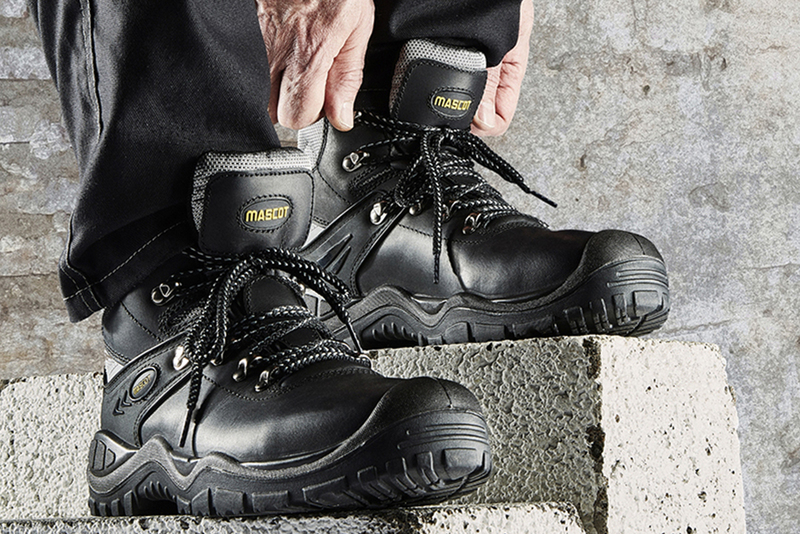 If your job requires additional ankle protection or further weather protection, you will also find safety boots with these specifications in Mascot Footwear Industry. The F0165-902 safety boot has a three-layer ankle protection that absorbs and spreads the pressure and impact on the ankle, preventing discomfort and injuries from external blows. For weather protection, choose boots with a SympaTex membrane that protects your feet against wind and water whilst allowing your feet to breathe.